Indian democracy? Towards transparency, accountability and ensuring citizen’s freedoms? What is Modi’s new talk of New India? Can Indian democracy succeed without fighting corruption and black money menace? Mr.Modi after the series of victories in the Assembly elections seemed to have changed his goals too. He was till now, that is, in his first two years was promising many things. Many pet schemes. Swatch Bharat etc. Now, suddenly he started talking of New India. Also, after the third meeting of the Niti Ayog meeting with all the chief ministers in attendance, the Prime Minister started talking about his three year action plan, seven year development plan and fifteen year vision plan! Even the traditional jargon had been dropped and new words and phrases had come in. Is this enlightening? What the assembled Chief Ministers had told in the meet? No information, no news. What sort of transparent governance is this? This is very unsatisfactory. Also, suddenly, the Supreme Court had ordered to create the Lokpal, the top anti-corruption institution that is hanging fire for a very long time. (Add from the previous writing). It is unlikely that this would be complied with. It is time India brings about proper political reforms to ensure that the Parliamentary system adheres to the British model of the two party systems. Two major parties, the ruling and the Opposition party and the rights and privileges of the Opposition party’s functioning. Now, there is a certain distortion. The ruling party with an overwhelming majority with a strong-minded Prime Minister tries to dominate and over-ride the checks and balances and tries to drown the voice of the opposition in many ways. And if this comes at a time when the leader of the opposition, not the formal front faced but the real power concentrated, as it is, at the hands of a dynastic member like Rahul Gandhi and when Rahul Gandhi is perceived to be weak and temperamental and highly arbitrary, then, the parliamentary system falters. Why, now even in the media, on TV screens there are open debates about sidelining Rahul Gandhi and bringing to the centre stage either Mamata Bannerjee or Nitish Kumar as the new face of Opposition unity. Whether this would work or Mr.Modi might find new ways to scuttle the opposition unity? This is the big question. As it is proved right now in India there are still discordant voices in the ruling combine as well as in the opposition ranks. India has a legitimate role as a leading democracy of the parliamentary type in the world outside UK. Even in the USA there is no such clear demarcation of the roles of the ruling and Opposition party. Or, the various coalitions, we find in the UK. There is the Liberal Democratic Party in the UK with a long history and pedigree of liberalist political tradition. In India, we had had some Left socialist parties in the beginning of our Republic. But now, they have gone and in their places are the very many regional parties, many smaller, splinter parties like JD(U) and JD(S) besides the left-over other small outfits, including the two Communist parties. The Indian polity is also highly polarised after the emergence of the BJP. But our religious communalism is very different to the Islamic communalism, the extremist, violent and terrorist parties and groups. The point here is that while democracy is spreading everywhere, the spelling out of the basic core values of democratic practices are not yet fully made clear. In fact, in our time, there are not enough clarity, no theoreticians have emerged or high profile critics have come forward to clearly define what are the next critical steps to deal with this worldwide crisis in the democratic systems and practices. In Russia Mr. Vladimir Putin, the incumbent president is perceived to be authoritarian, war monger and also using intelligence to interfere with other democracies, in the USA, now in Turkey and even in France. In India itself we see these various distortions making democracy and an open society highly corrupt, so many criminal cases pending before a delayed judicial system and also the media curbed and subtly terrorised and of course much false propaganda and brainwashing also noticed. In Russia, for instance, we see the suppression of democracy in a more brazen manner. 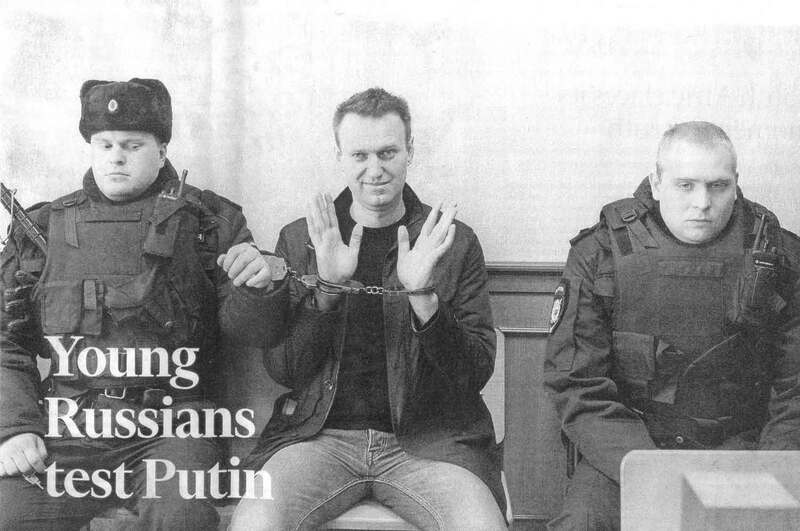 The Russian Opposition leader ,Alexei Navalny,(put Navalny picture here)who conducted some popular protests in Moscow and elsewhere, where his protests drew big crowds, he was arrested and handcuffed and his hand tied to the policeman guarding him in the court was highly publicised abroad and had earned Vladimir really bad name! So, this type of democratic government can be also a big power in international arena. There is no Opposition party in Russia, recognised in the constitution, we believe. Vladimir Putin is in power for 17 years. Putin also changed his roles, first as president, then as prime Minister and then again reverted to President Office! But then Russian democracy is hugely corrupt. Only now, it seems the Russians are taking to the streets, to protest against corruption, the Opposition leader had faced three criminal trials in the past six years. Charges for what? For organising protests! The Putin is criticised for spreading intrigue abroad and not facing challenges at home. There was an online video by Mr.Navalny accusing the number Two, Dimitry Medvedev, prime minister and one of Mr.Putin’s most loyal lieutenants, of a huge scheme of corruption that allegedly brought him to own large luxury estates and vineyeards. There is a tradition of suppression of political rights of citizens. Even before the 1917 Communist Revolution. Even in the pre-revolutionary Tsarist Russia. There even now, the Russian citizens are also a bit politically apathetic. May be the authoritarianism practised under Putin. 72 per cent of those aged between 18 and 24 voted for the Russian military occupation of Crimea in 2914.Russia is not bothered about the world opinion on this blatant military adventure. Are the Indian citizens politically more awakened than the Russian citizens? Better, we study this question in India. Leading political parties in India must set up research wings and study a comparative party systems and politics in some of the big nations, say, Russia, USA and China? There will be many useful lessons for us. So this is not a democracy as we know it. In India also we see many distortions. The Congress party, the historic party that won political freedom in the last 70 odd years, had progressively deteriorated into a third rate family dynasty. Sonia Gandhi’s incompetency is coming out, as she tries to hold her supporters together. Almost every day, some senior leader is deserting her or being “sacked”! What a leadership she is displaying? The ruling BJP is becoming more and more aggressive and trying to consolidate its power of the party and government in many novel ways. The Opposition, especially, the Congress is being marginalised by several forces, a series of electoral defeats, the new corruption scandals linking Vadra and Gandhi family. Also, other senior leaders of the Congress are also drawn into the corruption scenario, thus making the attempt to forge Opposition unity impossible. As commentators have noted that Mr.Modi might find Rahul Gandhi, to retain him as long as possible, is the best bet for him to remain as the only alternative before India. Times are ominous. Indian democracy’s biggest challenges are here, right now! Note: Excerpts from a forthcoming autobiography of Mr.V.Isvarmurti, M.A.Visva Bharati) M.A. (Oxon) former Member, Madras Legislative Council, formerly of the AICC, 1962-1967. Worked with Kamaraj, Atulya Ghosh, Sadiq Ali and others.